Listening to a little Pandora smooth jazz yesterday afternoon and came across a band I did not know anything about, The Funk Brothers. They were the band that played on many of the biggest hits from the Motown era. Who knew? The Funk Brothers was the nickname of Detroit, Michigan, session musicians who performed the backing to most Motown Records recordings from 1959 until the company moved to Los Angeles in 1972. 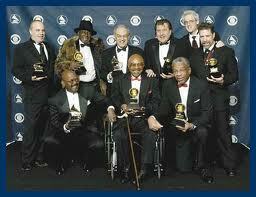 They are considered one of the most successful groups of studio musicians in music history. 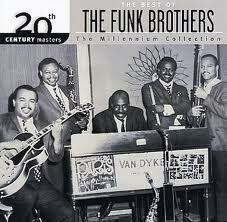 The Funk Brothers played on Motown hits such as “My Girl“, “I Heard It Through the Grapevine“, “Baby Love“, “Signed, Sealed, Delivered I’m Yours“, “Papa Was a Rollin’ Stone“, “The Tears of a Clown“, “Ain’t No Mountain High Enough“, and “(Love is Like a) Heat Wave“. The Funk Brothers were the brilliant but anonymous studio band responsible for the instrumental backing on countless Motown records from 1959 up to the company’s move to Los Angeles in 1972. Woefully under appreciated as architects of the fabled “Motown sound,” the individual musicians were rarely credited on the records that relied upon their performances, which downplayed their importance to the label. Motown’s sophisticated, urbane brand of R&B certainly would have been difficult to achieve without the extensive jazz training that many of the Funk Brothers brought to the table. In order to keep that sound a distinctive brand name, Motown signed most of the group to exclusive, highly restrictive contracts during their tenure, although a few peripheral members were able to moonlight on sessions for other companies from time to time. In more recent years, the Funk Brothers’ legacy has begun to receive proper attention, most notably in Allen Slutsky’s 1989 book Standing in the Shadows of Motown, which focused on bass genius James Jamerson, and the 2002 documentary film of the same name, which covered the group as a whole. Motown head Berry Gordy Jr. first assembled a studio band in 1959, culling its members from Detroit’s fertile club scene. Most of the players came from a jazz background, although some had more experience with blues or R&B, and there was a great deal of crossover among working musicians of the time. Among the early members were pianist/bandleader Joe Hunter (not to be confused with blues balladeer Ivory Joe Hunter) and the rhythm section of bassist James Jamerson and drummer William “Benny” Benjamin, who would go on to become the backbone of the Motown beat. Other regulars who came on board prior to 1962 were guitarists Robert White, Eddie Willis, and Joe Messina; alternate drummer Richard “Pistol” Allen; percussionists Jack Ashford (who handled the tambourine work) and Eddie “Bongo” Brown; and the aggressive pianist Earl Van Dyke, as well as numerous horn players. Eventually nicknamed the Funk Brothers, this aggregation would soon become an integral part of Motown’s rise to prominence and its commercial dominance during the glory years of 1963-1967. By 1964, Hunter had quit as bandleader, paving the way for classically trained keyboardist Johnny Griffith to join and for Van Dyke to become the group leader; drummer Uriel Jones also became an active member around the same time. In addition to the numerous hit singles they played on, the Funk Brothers also played quite often around the Detroit club scene. Things began to change over 1967-1968. The Motown hit factory was forced to reinvent its sound to fit changing trends, and with producer Norman Whitfield’s brand of psychedelic soul guiding the label’s fortunes, guitarist Wah Wah Watson came on board to update the Funk Brothers’ sound. Moreover, the groundbreaking rhythm section of James Jamerson and Benny Benjamin was coming apart due to substance abuse problems. Benjamin passed away in 1969, and Jones took a much greater role in the aftermath of his death. Meanwhile, the massively influential Jamerson had grown unreliable; while he still performed, white bassist Bob Babbitt picked up much of his slack, and did an excellent job of replicating Jamerson’s unpredictable melodicism. This core group remained together until 1972, when Gordy moved the Motown offices to Los Angeles, unceremoniously abandoning the Funk Brothers. Still, the group did get one glorious last hurrah in Marvin Gaye‘s 1971 masterpiece What’s Going On, which made full use of the band’s jazz training (and listed full musician credits). Some of the Funk Brothers went on to other session and backup gigs, while others soon drifted out of the music business; regardless, most of them remained in Detroit. James Jamerson passed away in 1983, and only received wider recognition posthumously; he was finally inducted into the Rock & Roll Hall of Fame in 2000 in the sideman category. Eddie “Bongo” Brown also died in 1983; Earl Van Dyke passed on in 1992 and Robert White did the same in 1994. The surviving core members of the Funk Brothers reunited for Paul Justman’s documentary Standing in the Shadows of Motown, which was released in 2002 to generally excellent reviews; the same year, however, Richard “Pistol” Allen and Johnny Griffith both passed away. Next postWhat I Like About You?